Leafminers are larvae of various insects: small black flies, moths, sawflies or beetles, many of them specific to certain plants. The fly that lays the eggs on beets does not lay eggs on any other plant. These various critters lay eggs on the undersides of leaves of many plants found in the home landscape. Hatching larvae are green or black and are small, about 1/8 inch long. They hatch and immediately tunnel inside the leaves and feed between the upper and lower surfaces, causing white to brown tunnels or blotches on the leaves. There can be stem damage below the soil. 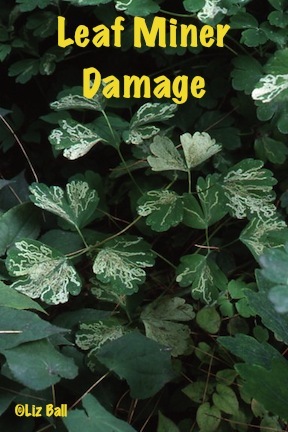 Leafminers carry black leg and soft rot diseases. Several generations develop each summer. Winters are passed in a cocoon in the soil. Many species occur throughout North America. Emergence Time - Leafminers emerge from the soil in early spring. Egg laying continues throughout the summer as new generations mature. Plants Affected - In the flower garden, Nasturtium, Chrysanthemum. Among trees and shrubs include Arborvitae, Azalea, Rhododendron, Holly, and Roses. In the vegetable garden, Lettuce, Beets, Swiss Chard, Spinach, Celery, Parsnip, peppers, potatoes; sometimes parsley and carrots. Beets are particularly vulnerable. If you wait until the lilac blooms are past to plant your beets, you will have fewer problems with leaf miners because the fly that lays the eggs on beets has finished her season. These pests cause yellow and white to brown tunnels or blotches between upper and lower leaf surfaces. These tunnels wander all over the leaf even making loops. Tunnels have specks of excrement inside. Larvae are often visible through leaf tissue. Leaves may later blister or curl, turn brown, and die.